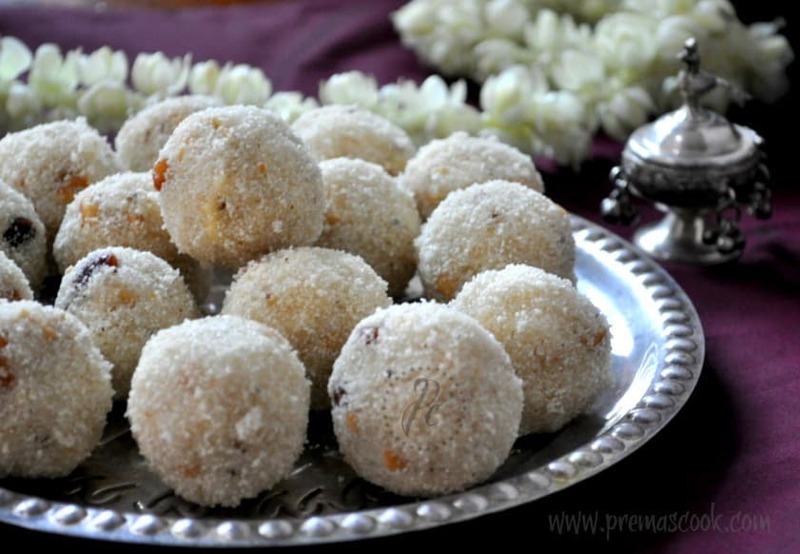 Rava Ladoo | Rava Laddu is one of my fav sweet which can be very easy to make in less time.I really love the coarse texture of the rava and crunchy taste of coconut in this ladoo.Do try this easy ladoo and make the festival rich. Heat a tsp of ghee in a kadai. Once the ghee turns hot enough, simmer the flame, roast cashew nuts and raisins.keep it aside in a plate. Then roast the coconut in the same kadai ,without changing the colour. Add the remaining ghee and roast the Rava till its get well roasted or until the aroma starts coming out.Once done add in the sugar.Switch off the stove. Remove the kadai from the stove and add in the roasted cashew nut and raisins,cardamom powder,roasted coconut and mix well. Now add in the 2 tbsp milk and mix well. Then roll it asap in lemon sized balls . While roasting,keep the flame low otherwise there is a chance it may turns over roasted or burnt. If you are going to keep this for long avoid adding coconut and milk.Add ghee to make balls. If you don’t like adding rava directly you can powder it after roasting the rava. wow…Beautiful pic…Tempting small yummy bites…. 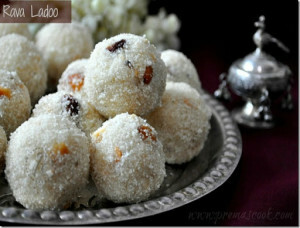 love this coconut rava ladoo n beautiful clicks.. It looks soo crunchy n tasty!! super tempting. you just convinced me to make it once again. 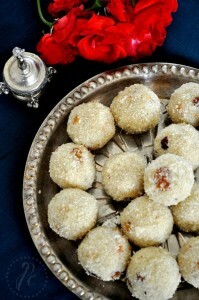 Very apt and prefect laddoos for the celebration..Love rava laddoos very much. Droolworthy ladoos Prema, Yummy and mouth-melting. rava laddoo looks really delicious.